Born in Taiwan. Mother of five and grandmother of five more. While working at an international trading company after marriage, Alice was transferred abroad to a position in Rochester, NY. In 1981, she took up a post in Houston, where she raised children while working as a regional developer and general contractor until retiring in 2011. She started ikebana (Japanese flower arranging) in 2015, and is now a member of the Ikebana International Houston. Alice has visited Japan numerous times. 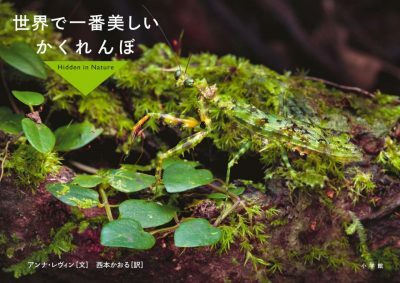 Last year, she travelled to both the Gero Onsen in Gifu and Japan’s northwestern Hokurikyu region, and plans to take a tour of the Izu Peninsula with her husband this coming May. 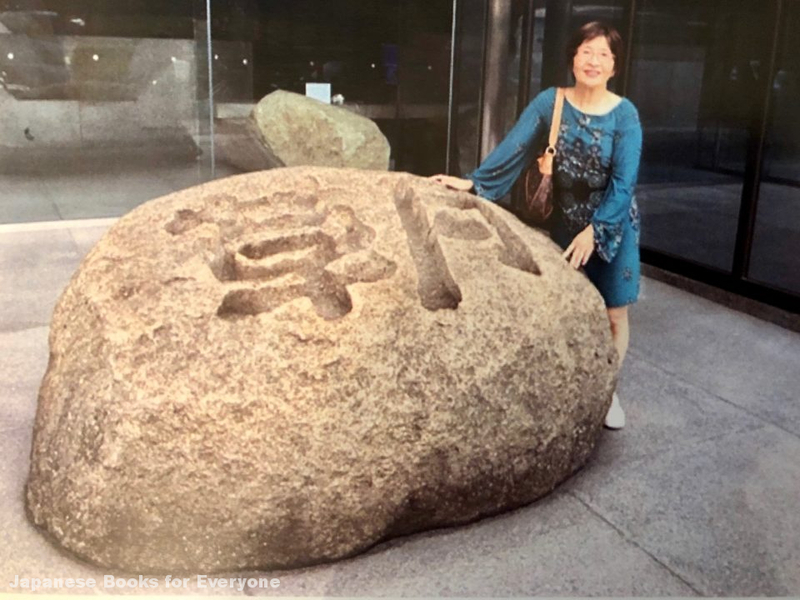 Alice first came across ikebana after recovering from a long battle with illness, when her son, who is very knowledgeable about Japan, signed her up for social activities at his place of work. The energy of the flowers filled her heart and soul. 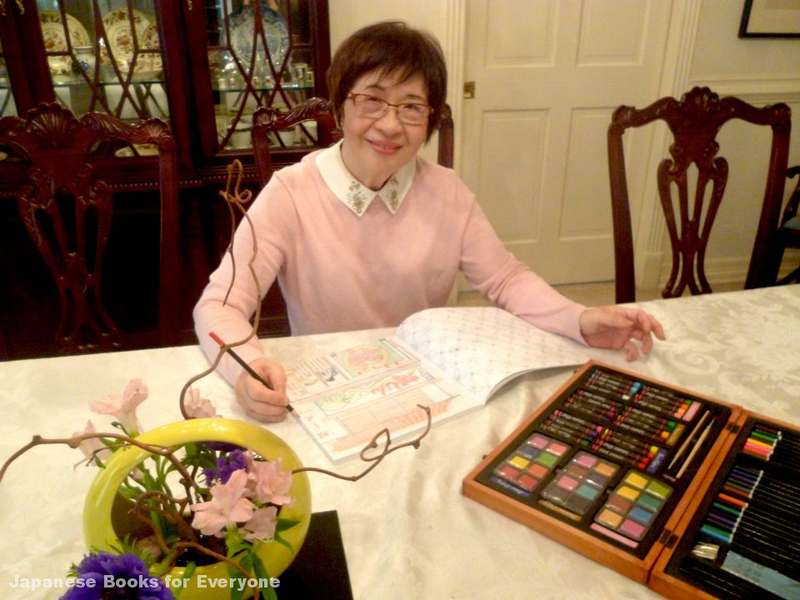 Looking at her ikebana diary now, one finds a detailed handwritten record of what she has learned each and every week, with a sprinkling of Japanese here and there. 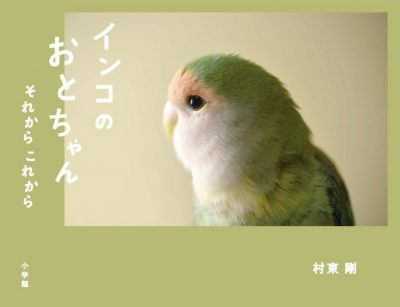 “My father was a pharmacist and had a trading business with Japan, so he was very skillful in Japanese. 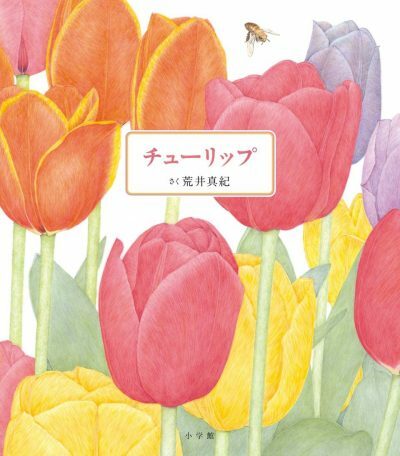 Because of him, I’m also learning a little Japanese myself.” Having been raised under Japanophile parents, Alice explains, she has felt a closeness to the country since she was very young. The photo below shows Alice attending an English ikebana class at the Sogetsu headquarters in Tokyo, 2017. Although Alice is currently immersed in her ikebana practice, she has always been a lover of art. Above all else, she is most proud of her lifelong hobby of sewing, which she learned from her mother. “I love fabric,” she admits. “Combining fabrics of various colors and patterns has been a part of some of my most joyful memories.” Since her youth, Alice has been particularly drawn to the stunningly decorated fabrics of traditional Japanese kimono. “When I visited the Nishijin textile shops of Kyoto, I was completely enchanted by the elegant beauty of the kimono—oh! That’s right!” she says, dashing up to the second floor as if she’s suddenly remembered something. She returns holding a “Jenny” doll, who wears a kimono of dyed Kyo-yuzen silk. In 1985, Alice had fallen in love with the doll’s patterned kimono at Tokyo’s Mitsukoshi department store and purchased it as a Christmas gift for her daughter. “But I only recently learned the difference between the Kyo-yuzenand Nishijin techniques!” she laughs. 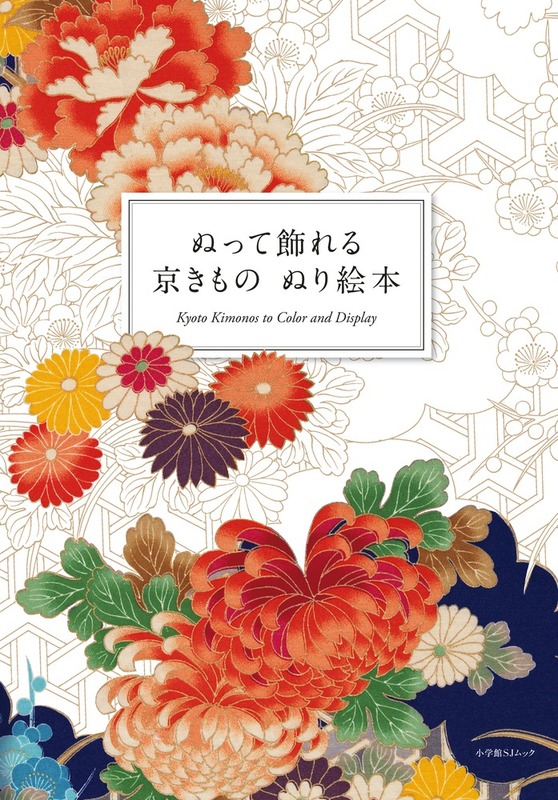 This has a plethora of designs for Kyo-yuzen silks, which express the aesthetic sensibilities of Japan through motifs of the four seasons. 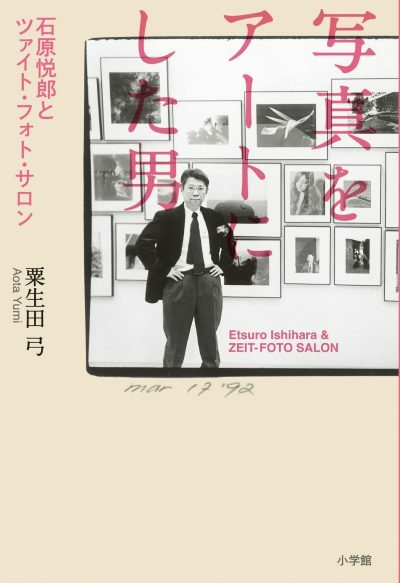 For a student of ikebana like myself, the book really stimulates my senses. Most notable are patterns of the bountiful cherry blossoms in full bloom and the wild birds that signal the start of spring. Just by coloring the spring scenery, my heart becomes bright and cheerful. A pattern featuring exquisite festival floats brings makes me nostalgic for the time I visited the Nagoya City Art Museum. All the designs breathe of traditional Japanese culture—just by looking at them, I’m entranced. 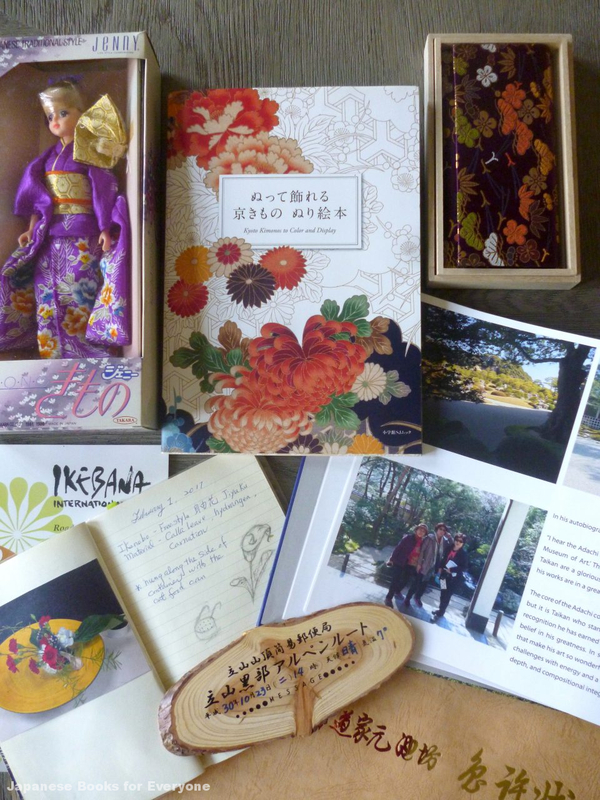 I really enjoy going through this book while being reminded of all my adventures in Japan.